In 2007, responding to a clear need for increased knowledge-sharing on climate change adaptation, the Stockholm Environment Institute (SEI) Oxford Centre launched wikiADAPT. The goal was to enable the collaborative writing of articles on adaptation, and to create a space for researchers and practitioners working in the field to share experiences, useful tools and methods. 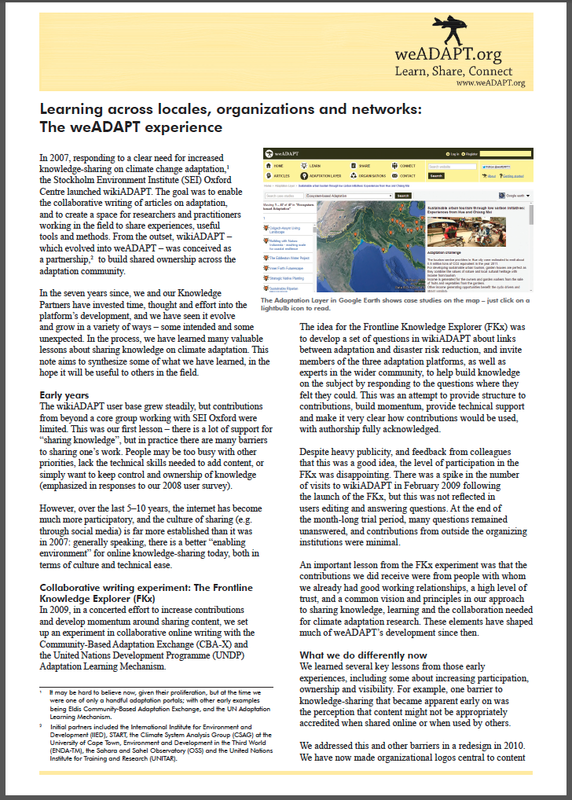 From the outset, wikiADAPT – which evolved into weADAPT – was conceived as a partnership,2 to build shared ownership across the adaptation community. In the seven years since, we and our Knowledge Partners have invested time, thought and effort into the platform’s development, and we have seen it evolve and grow in a variety of ways – some intended and some unexpected. In the process, we have learned many valuable lessons about sharing knowledge on climate adaptation. This note aims to synthesize some of what we have learned, in the hope it will be useful to others in the field. Many of the lessons described in this note are found elsewhere in the wide literature on knowledge management, particularly as it relates to development (see, e.g., Fisher 2011). This suggests that although there are certainly challenges that are unique, or have greater significance in adaptation, many of the issues are the same as those faced in other fields. This reinforces the need to draw on ideas and solutions from other disciplines, including those that are not immediately obvious, such as the work on networks and organizational sharing within the business community or the global health sector. 1) Content creation doesn’t just happen. 2) There is no substitute for face-to-face user engagement. 3) Relationships and networks matter. 4) Analytics are important, but measuring “impact” is hard. 5) Technology is important... but not without a purpose. 6) We need adaptation champions. 7) A knowledge platform should support decision-making, not just provide information. 8) Financial sustainability is an ongoing challenge. The adaptation knowledge management field has changed significantly in the past six years, and will no doubt continue to do so. There are exciting technical developments beginning to mature, with Linked Open Data in particular having great potential to facilitate the sharing and reuse of information. However, for knowledge-sharing to lead to better adaptation decisions and actions on the ground, there needs to be a clearer understanding of how information is interpreted and used, as well as the complex ways in which decision-making processes can be influenced. Tied to this, a key focus must be to develop messages appropriate for different types of audience as opposed to simple information supply taking into account potential information access, types of delivery and factors affecting receptivity. There is growing research in this area that could usefully be applied (see, e.g., Jost 2013). Above all, building and retaining strong online and offline relationships with users remains crucial in developing a community willing to create and share knowledge for adaptation. Smith, B., Bharwani, S., Taylor, A., Rastall, M., Coll Besa, M. and Devisscher, T. (2013) Learning across locales, organisations and networks - The weADAPT experience. weADAPT Briefing Note. This publication highlights the experience and lessons learned from a Community Digital Storytelling activity within the Integrated Community-based Adaptation in the Mekong (ICAM) Project. Read about the storytelling project with the Cham fisherwomen and men in Vietnam which was the first time CARE Vietnam had used Community Digital Storytelling.